Josh Bidwell is a family man of God, a cancer survivor, former University of Oregon football player, and 12 season NFL football punter. His road to success was not easy, as many disparities stood in his path. However, inspired by these pivotal chapters of his life, Josh wanted to find a way to give back to his hometown community as it did for him many years ago. Thus, in 2006, the Josh Bidwell Foundation began; set out to impact The Community Cancer Center, Douglas County Youth Sports Programs, Youth Services and Young Life. As the JBF continued to grow, the Josh Bidwell Scholarship program emerged in 2016, and the Josh Bidwell Family Outreach program launched in 2017. In total, these events allow the JBF to provide services to the community year-round. When Josh was receiving treatment during his battle with testicular cancer, he was not able to do so in Douglas County. For the sickest months of his life, he and his family were forced to travel out of the area for adequate treatment. Josh wanted to ensure that other Douglas County residents were able to receive treatment comfortably in their local town. Therefore, a portion of the proceeds are gifted to the Community Cancer Center. Josh credits his small town for his involvement and success in athletics from their generous financial support. Believing that “it takes a village” to raise strong and prosperous children, the JBF provides many youth and sports programs with funding, equipment, and support every year. 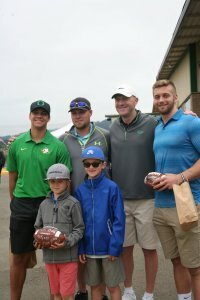 Each year, the Josh Bidwell Foundation hosts a two-day event; dinner/auction and Celebrity Golf Classic. The JBF is a 501(c)3 organization and 100% of the funds raised remain in Douglas County. All JBF Board members are volunteer and share Josh’s love and passion for their community. We hope to see you at the next event! Please watch this short video to hear Josh tell his story.